What's Missing From Your Omnichannel Strategy? 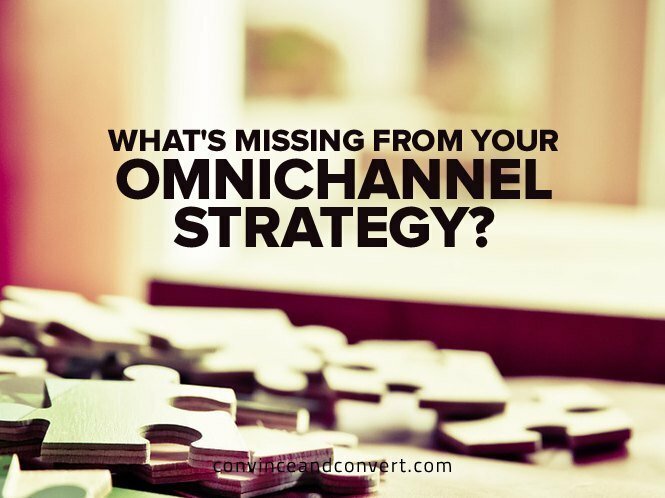 What’s Missing From Your Omnichannel Strategy? It’s easy to become caught up in the details of what constitutes a great customer experience and forget to mirror customer actions. To improve your omnichannel marketing strategies, you should direct staff members to go through stages of the customer experience. Instruct them to look for factors that may cause people to give up without making purchases or cause them to become frustrated and not return. If the customer experience is much more difficult than necessary, consider removing potential purchasing barriers. Last month, data from BDO showed that, in 2015, many retailers began recognizing the value of mobile platforms. Case in point: Amazon rolled out same-day delivery service, plus an accompanying app that caters to people who want to buy things when they’re out and about, knowing their purchases will be delivered soon afterwards. Beauty discovery service Birchbox made it possible for Android users to choose cosmetics from their phone for easy purchasing. Amazon and Birchbox are only two examples of companies that evolved with mobile technology. If you’re not thinking of doing the same in 2016, you’re likely missing out on a major segment of the market. If you own brick-and-mortar store locations that sell a very deep selection of inventory, you may struggle with the challenges of showing customers an accurate picture of your merchandise. This was an issue encountered by True Religion, a jeans company that has numerous denim styles but characteristically small boutique stores. The retailer partnered with exterior providers to create an “endless aisle” solution. Using Apple Watches, in-store associates can sort through the brand’s full selection of jeans, select a certain pair, and then send a picture of it to a high-definition TV for a customer to view. When someone wants to buy a pair, the sales representative can simply scan a barcode on the image and have the selection sent to a customer’s home. True Religion hopes to eventually expand this technology to include fulfillment via local stores. You shouldn’t overlook the visual experience when delivering content to shoppers. When people walk into a Target store, they immediately see a bright red bullseye, shopping carts, benches, and baskets that feature the same distinctive red hue. Most people associate that color with the brand almost immediately. Shoppers should enjoy the same visually rich experiences regardless of how they shop. In addition to the color palette you use, show consistency with font type and size. When designing for mobile customers, try to mimic in-store browsing as much as possible. Allow people to zoom in on product images and view them from multiple angles. Serving beautiful visual content is more than a good omnichannel marketing strategy. It also lets people know what to expect and demonstrates the style your brand represents. There are many reasons why data should drive your omnichannel marketing efforts. It can help you provide them with unique offers and seamless interactions. A customer who habitually buys a certain type of shampoo might appreciate a coupon for it. Another customer might appreciate a discount on his or her one-year anniversary of being a customer. Data collection can be done in non-intrusive ways, and it can help you understand purchasing motivations. It will also let your customers know you understand what they need. Now that you know several things you might be overlooking in your omnichannel marketing plan, it’s time to tackle your shortcomings. Maintain a flexible mindset when making improvements, so it’s easier to respond to customer feedback.